The definition of a low-end notebook PC has changed radically in the past year, ever since the arrival of the portable Pentium III processor and Intel's SpeedStep technology, which adjusts clock speed on the fly to reduce power consumption. IBM's ThinkPad i series of notebooks come with 500-MHz Celeron processors, 64M of RAM, 6G hard drives and 12.1-inchs screens. They weigh 6 pounds and start at $1,700. Last year, a high-end notebook PC came with a Pentium II chip fast enough to handle most Microsoft Windows applications as long as you weren't running sophisticated 3-D graphics or animation software. Now, many manufacturers consider low-end to be a bare-bones Pentium III model that doesn't have SpeedStep. But all the breakneck speed and power you get in the newest models might be more than you need, particularly at notebook PC prices. Many office workers are still very productive running 266-MHz or even slower Pentium II desktop PCs, so why not buy a notebook with similar capabilities? Actually, there is a good reason why not'they can be hard to find. Unlike desktop systems, for which a PC typically is priced without the monitor, portable computers come with relatively expensive flat-panel displays reflected in the price of even low-end models. 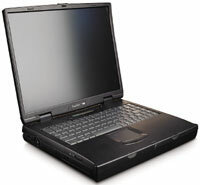 This sets a comparatively high entry point for notebook PCs because the processor is not the most expensive component, as it is with many low-end desktop computers. If you're already paying for the monitor, the price difference in adding more computing power might not look so big. Perhaps as a result, manufacturers don't make many low-end models. A notebook PC buyer needs to consider a slightly different set of criteria than does someone shopping for a desktop system. Because it's impossible to upgrade a notebook PC's monitor and usually expensive to upgrade its processor, memory or hard drive size, it often makes sense to buy more notebook PC power than you need at the moment. Full-time mobile executives, presenters and technicians who essentially need desktop PC power on the road should consider that approach. This guide is not for them. The TransPort NX from Micron Electronics has a 400-MHz Pentium II processor, 64M of RAM, a 6G hard drive and a 15-inch screen. It weighs 6.2 pounds and is priced at $1,549. But many notebooks are used only occasionally or are passed around the office to whoever is on the road. In that case, a low-end unit could be in order. The occasional notebook PC user most likely needs three things: word processing, spreadsheet and e-mail programs, usually combined with limited Internet browsing. Unless you are trying to run Microsoft Windows 2000, the slowest new notebook you can buy today can easily handle all these office tasks. Hard drives of 2G to 6G are plenty for these occasional users' demands, as is 64M or even less of RAM. Even weight isn't as important a factor. When you carry a portable computer only occasionally, you can put up with a few extra pounds that would be unacceptable as everyday luggage. Some heavy-duty road warriors who just don't have the budget for the computing power they really need are stuck with low-end notebook PCs. For these workers, it's important to remember that the size and quality of the screen are probably the two most vital features, even before performance. Hewlett-Packard's OmniBook XE2 is a 6.4-pound unit with a 450-MHz K6-2 processor, 32M of RAM, a 4.3G hard drive and a 12.1-inch screen. It's priced at $1,197. It's a little annoying to have to wait a few extra seconds for a spreadsheet to recalculate, but a poor-quality screen can become unbearable when you work for several hours at a stretch. Most of the models included in this buying guide use Intel Celeron processors, although there also is a good assortment of Pentium II processors and notebook PCs with K6-2 chips from Advanced Micro Devices Inc. of Sunnyvale, Calif. And the refurbished models listed also feature some first-generation Pentiums. The base weight of these PCs goes as low as 2.4 pounds for the Sony Electronics Inc. Vaio PictureBook, which has only an 8.9-inch screen, and as high as 7.6 pounds for Sager Midern's NP2330-C. If you're going to be carrying it around, remember that a unit's travel weight will be about 2 pounds more than its base weight, once you have accounted for batteries and other accessories. For many occasional users who need a notebook for basic on-the-road tasks, screen size and quality can be more important than processor speed. Although many low-end models have displays of only 12.1 inches or even less, some of the models listed here feature 14-inch screens'and one, Micron Electronics Inc.'s TransPort NX, has a 15-inch screen. The luxury of having a bigger viewing area is reflected in the price; it's up to you whether the extra money you'll pay is worth it. Price is another area where desktop and notebook PCs diverge. You can find a fairly powerful desktop model for $1,000 or less, a price range that doesn't carry over to portables'at least not to new ones. Discontinued and refurbished notebooks are the only sub-$1,000 portables available today. For as little as $500, you can get a top-name refurbished notebook PC with 64M of RAM, a 4G hard drive and perhaps a 200-MHz or faster Pentium processor. 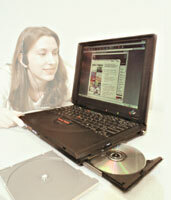 This can be an excellent buy for a user who needs only word processing or e-mail access. 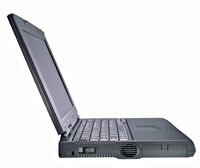 Acer America's TravelMate 505DX has a 433-MHz Celeron processor, 32M of RAM, a 4.8G hard drive and a 12.1-inch screen. It weighs 5 pounds and is priced at $1,099. The disadvantage in buying an older system isn't reliability; you can easily get one with a one-year warranty. Nor is it the slow processor speed; in many cases, a first-generation Pentium will do a fine job. The biggest problems are the older screen technology and slower modems that come in many refurbished units. On the other hand, a $1,500 budget can buy three refurbished notebooks instead of only one new machine. Because even the hottest notebook has a practical lifetime of about three years'and only one year before needing a $100 or $200 battery upgrade'it can make a lot of sense to buy two or even more identical refurbished notebooks. You can get one into the hands of each person who needs one, and you can treat the PCs as disposable items that you'll need to replace in a year or two. Before you look at price, weight, or performance, it's vital to focus on who precisely will use a notebook and what tasks they will have to perform.
' For general use, buy a bit more power than you need at the moment.
' For limited uses, check out refurbished notebooks'they are the real bargains.
' In making your choice, balance price, processing power, screen quality and weight.
' Remember that older refurbished models lack Universal Serial Bus ports and might also need modem upgrades.
' 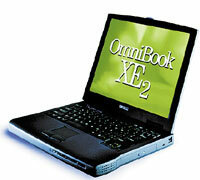 View low-end refurbished notebooks as disposable. For occasional use and only basic word processing and spreadsheet needs'which is about what you would have asked a midrange office desktop PC to do three years ago'you can probably choose a notebook almost entirely on price. And if price is your primary criterion, keep in mind that, for some users, a low-end notebook PC will be only slightly more useful than a personal digital assistant, which will cost and weigh far less. When looking at very low-end notebooks, consider just how many of the required functions can be performed with a PDA instead of a notebook. A PDA can do word processing, share files, handle database files and even use Microsoft Excel-compatible spreadsheets, so for some users it could be an even better choice than a low-end portable.